, an English lawyer, and sometime recorder of London, was born in that city, and educated at Peter-house, Cambridge; where he took the degree of B. A. 1764, and of M. A. 1767. After prosecuting his lawstudies, he was admitted to the bar, and began to distinguish himself about the year 1770, when he took an active part in the political contentions of that period. 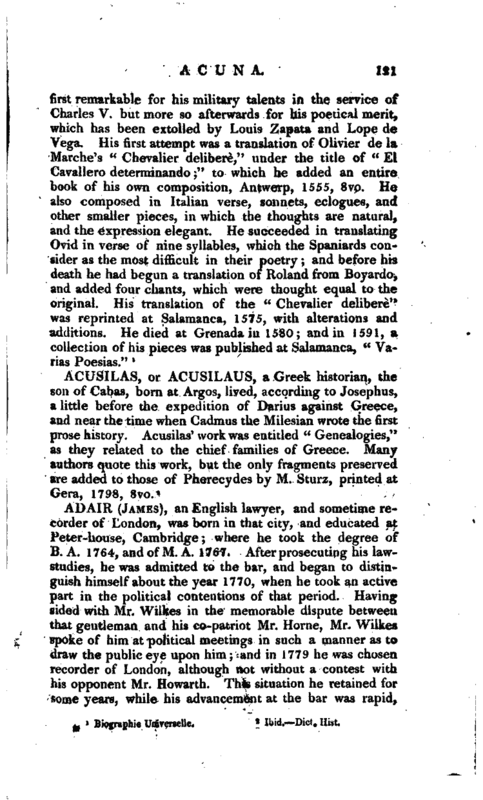 Having sided with Mr. Wilkes in the memorable dispute between that gentleman and his co-patriot Mr. Home, Mr. Wilkes spoke of him at political meetings in such a manner as to draw the public eye upon him; and in 1779 he was chosen recorder of London, although not without a contest with his opponent Mr. Howarth. This situation he retained for some years, while his advancement at the bar was rapid, | and highly honourable to his talents. The duties of the recordership he discharged with much ability, strict justice, and humanity. The situation, however, was rendered in some degree irksome by the changes of political sentiment which had taken place among his constituents, the members of the corporation. When he was chosen into this office, the city was out of humour with the court, and Mr. Adair probably owed his election to his being reputedly of Wilkes’s party, who was still rhe idol of the city. A great revolution, however, took place when the coalition-administration (that of lord North and Mr. Fox) was overthrown. Mr. Pitt and his friends, and by consequence the King and court, became highly popular in the city, while Mr. Adair retained his old opinions, took the part of the dismissed ministers, and became a zealous assertor of the whig principles which were then divulged from a newly-erected club, called the Whig club. This could not please his city friends; although such was his impartiality and integrity, that no fault could be found with the manner in which he discharged the duties of his office. 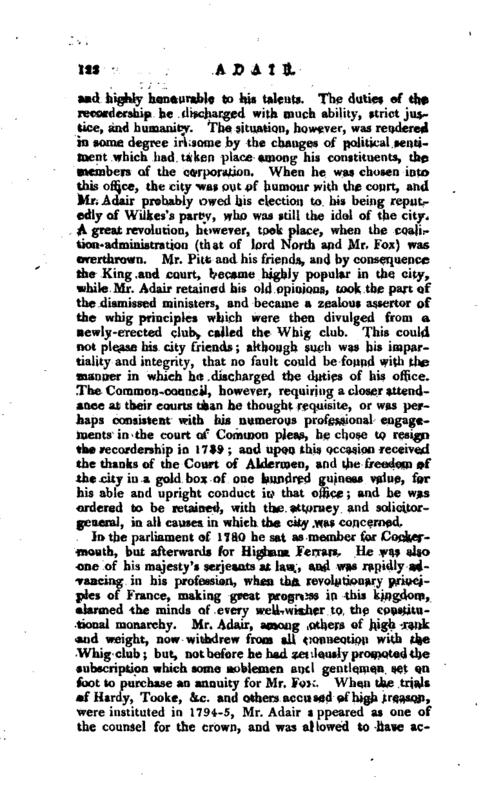 The Common-council, however, requiring a closer attendance at their courts than he thought requisite, or was perhaps consistent with his numerous professional engagements in the court of Common pleas, he chose to resign the recordership in 1789; and upon this occasion received the thanks of the Court of Aldermen, and the freedom of the city in a gold box of one hundred guineas value, for his able and upright conduct in that office; and he was ordered to be retained, with the attorney and solicitorgeneral, in all causes in which the city was concerned. In the parliament of 1780 he sat as member for Cockermouth, but afterwards for Higham Ferrars. He was also one of his majesty’s Serjeants at law, and was rapidly advancing in his profession, when the revolutionary principles of France, making great progress in this kingdom, alarmed the minds of every well-wisher to the constitutional monarchy. Mr. Adair, among others of high rank and weight, now withdrew from all connection with the Whig club; but, not before he had zealously promoted the subscription which some noblemen and gentlemen set on foot to purchase an annuity for Mr. Fox. When the trials of Hardy, Tooke, &c. and others accused of high treason, were instituted in 1794-5, Mr. Adair appeared as one of the counsel fof the crown, and was allowed to have | acquitted himself with great ability. In 1798, when the country was menaced with threats of invasion, volunteer offers of service were made to government throughout the whole kingdom, and London and its environs raised a force of about twelve thousand men, fuily armed, equipped, and trained at their own expence. Mr. Adair, although his age might have formed a sufficient excuse, thought proper to join this patriot band; and, it is thought, fell a sacrifice to the fatigues attending the discipline. The day his corps returned from shooting at a target near London, July 21, 1798, he was seized with a paralytic stroke, while walking along Lincoln’s-inn, and died in a few hours. 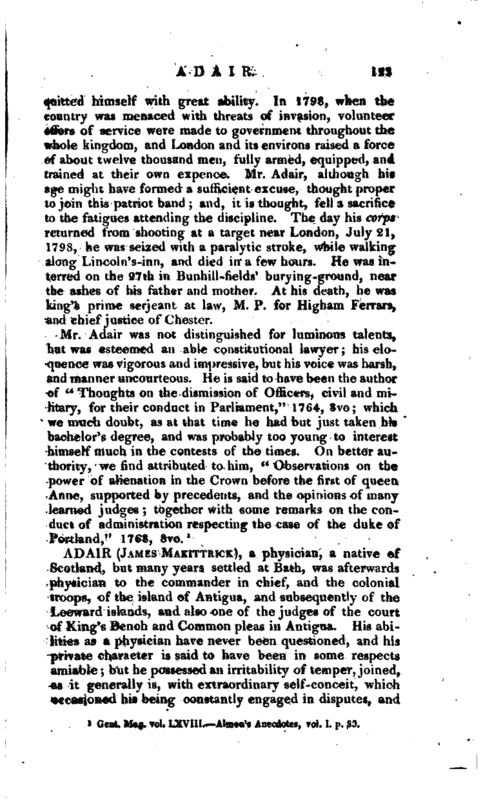 He was interred on the 27th in Bunhill-rields’ burying-ground, near the ashes of his father and mother. At his death, he was king’s prime serjeant at law, M. P. for Higham Ferrars, and chief justice of Chester.